All too often a 401(k) or 403(b) plan is created only to be quickly forgotten without any subsequent review or updates. Lawsuits against plan sponsors for failure to perform ongoing fiduciary duties are becoming increasingly common. While this litigation initially targeted billion-dollar plans, recently plans in the multi-million dollar range have come under scrutiny. As a fiduciary, every plan sponsor has a duty to periodically monitor their plan for compliance, reasonableness of fees, and best practices. Charter Capital Management is a specialist advisor for retirement plans. With the knowledge, background, and experience to properly review plans, we objectively share what’s working well while also pointing out areas that could use improvement. 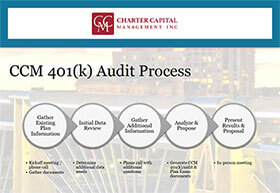 Our CCM 401(k) Audit Process results in furnishing plan sponsors with a better understanding of their level of risk along with guidance on how to mitigate that risk. Best of all, there is no cost nor obligation for this valuable service. Plan sponsors owe it to themselves, their company, and their participants to fulfill this fiduciary duty and to complete the contact form below.